the Berita Harian interview | escaped. Last two months, I received an email from a journalist, asking for an interview..on blogging and career. It was the first time this blog (or me, for that matter) has been offered to be featured on a local newspaper, so at first I couldn't believe it. Forwarded the email to the husband (because we share everything with each other T.T) and received an encouraging response from him, which prompted my reply to the journalist. It was a journalist from Berita Harian. So long story short, after a few phone calls from the journalist, I was there at their NSTP office in Bangsar for the article's photoshoot. More than 20+ pictures were taken from different angle, different poses, different setting - I realized there's just so much hard work behind a newspaper article! Have so much respect for the people behind every newspaper article now. So..this was how it turned out. Husband posted it on Facebook, and brought home a laminated piece of it with a Secret Recipe cake to celebrate. So not cool. But I know a few years back when I just started doing this blog seriously, if something like this happens, I know he would be the only person I'd celebrate with. He might not agree with some of the things I do, i.e exposing too much, or posing too much, etc but one thing for sure, he's always been my number one fan. It's probably another milestone for this blog and me for that matter, but regardless of wherever this blog takes me, I'd always have him to thank. 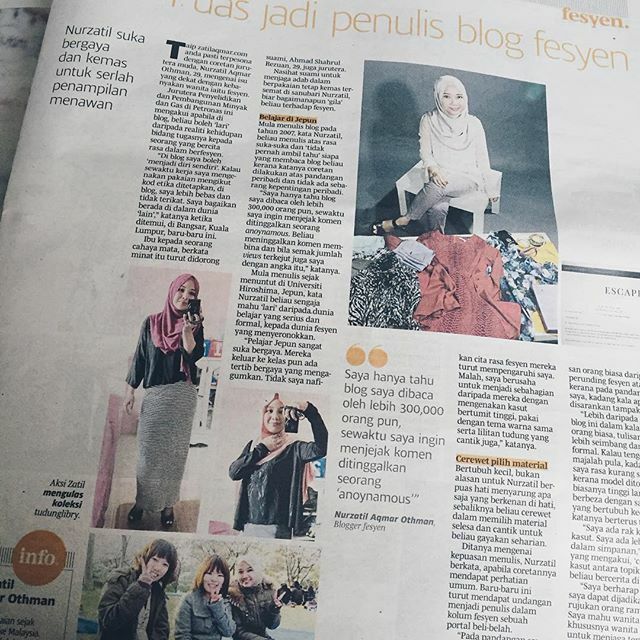 And also, thank you Berita Harian for the article!